Rheumatoid arthritis or RA is an autoimmune disorder that is caused by body's immune system attacking the lining of the small joints of hands and feet, resulting in painful swelling. In a long term, bone abrasion and joint impairment can occur. In contrast to osteoarthritis, rheumatoid arthritis is not due to the mechanical wear-and-tear of the joints, but due to chronic inflammation of the lining of the joints. Apart from joints, rheumatoid arthritis also affects eyes, lungs, skin and blood vessels. Seropositive rheumatoid arthritis is one result of RA test. Let's get close and know more. What Does a Seropositive Result Mean in Rheumatoid Arthritis Test? Being seropositive in rheumatoid arthritis test means that your blood tests shows traces of 2 protein: rheumatoid factor (RF) or anti-CCP. These proteins are indicative of the presence of rheumatoid arthritis in the body. 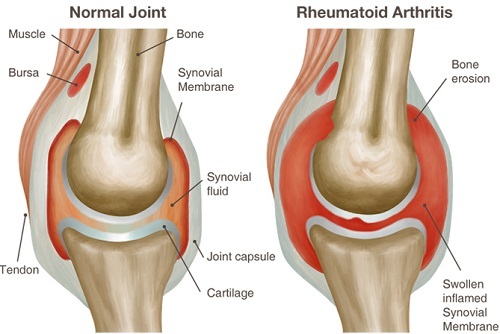 Although having seropositive rheumatoid arthritis does not definitely confirm that you have rheumatoid arthritis; however, it does provide significant proof to do more investigatory tests which focus more on finding inflammation around joints and the extent of bone damage and other extra-articular features using X-rays. Being seropositive for RF is not exclusive to rheumatoid arthritis because it is found in 10% of the healthy population and may also be found in individuals suffering from Sjögren's syndrome, hepatitis C, systemic lupus erythematosus and various chronic infections. However, seropositive patients are more liable to develop serious illnesses and have extra-articular problems as compared to seronegative persons. What Alternative Tests Are Available to Diagnose RA? Test for anti-CPP has a high specificity of 95% because they're rarely positive in the absence of RF. Another similar test is anti-MCV (mutated citrullinated Vimentin) test. Another test that combines anti-MCV and RF is point-of-care-test (POCT) which holds a sensitivity of 72% and a specificity of 99.7%. Rheumatoid arthritis is a chronic autoimmune inflammatory disease that is more common in women and can occur in any age. It leads to joint damage. If you get a test result of seropositive rheumatoid arthritis, which further confirmed by follow-up tests, you should take the following medications to treat rheumatoid arthritis. NSAIDs decrease inflammation and relieve pain. NSAIDs include Ibuprofen e.g. Advil, Motrin IB, Naproxen sodium e.g. Aleve. Doctor may prescribe stronger NSAIDs. Side effects include irritation of the stomach lining, liver and kidney damage. Corticosteroids, such as prednisone, fight inflammation and delay joint damage. Doctors prescribe corticosteroids to manage acute symptoms and reduce the doses as the symptoms subside. Side effects include weight gain, diabetes and thinning of bones. DMARDs (Disease-modifying antirheumatic drugs) can delay the progression of rheumatoid arthritis and impede permanent damage, which include methotrexate (Texal), hydroxychloroquine (Plequelin) and leflunomide (Arava). Side effects include liver damage, lung infections and bone marrow suppression. Biological agents, also called biologic response modifiers, are new DMARDs, including abatacept (Orencia), etanercept (Enbrel) and tofacitinib (Xeljanz). It works on the inflammation-triggering immune system to treat joint and tissue damage. It works better when combined with nonbiologic DMARDs. Side effects include increased risk of infection. A therapist can help seropositive rheumatoid arthritis patients by teaching them different ways of doing everyday tasks which are easier on the joints, demonstrating daily exercises that make the joints more flexible and introducing assistive devices to patients to reduce the stress put on the joints while performing mediocre tasks. Customized tools like kitchen knife with a saw handle and buttonhooks can make such tasks easier. Complete joint replacement surgery: The surgeon replaces all irreversibly damaged joint parts with new metallic and plastic prosthetics. Tendon repair: Tendons may lose elasticity or tear due to damaged and inflamed joints. The surgeon reconstructs torn tendons. Joint fusion: If joint replacement is not an option, the surgeon may combine and readjust joint parts to relieve pain. With every surgery there’s a risk of bleeding out, infection and post-op pain. Exercising on a daily basis can restore the muscles attached to joints. It helps patients fight tiredness. Consulting your doctor before exercising is recommended. It is advised not to exercise inflamed or aching joints. Applying heat or cold to the affected joints can help as well. Heat relaxes tensed and aching muscles whereas cold soothes and numbs the sensation of pain. Meditating and trying to relax by techniques such as guided imagery can help patients manage pain better.